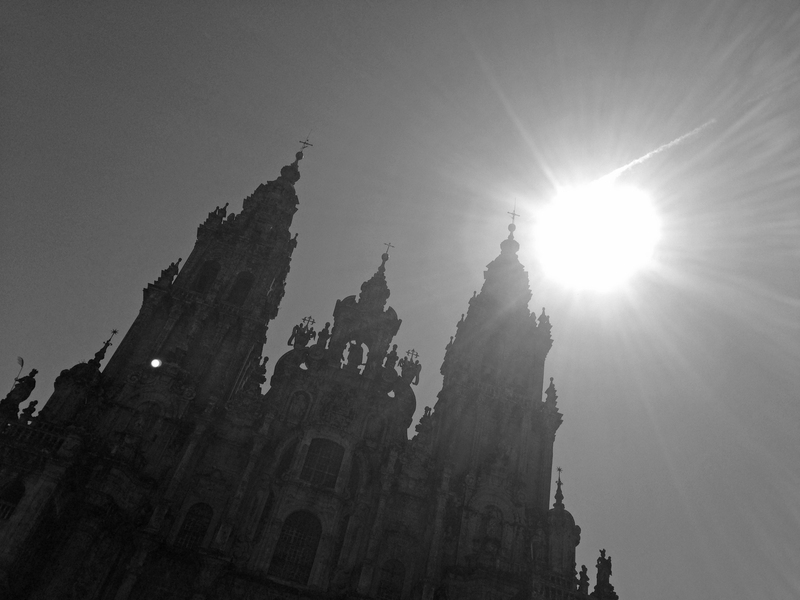 The goal today was to reach Santiago in time for the midday pilgrim’s mass at the cathedral. I found it quite an emotional walk, I was thinking about the past month and all the people I had met and the experiences I’d had. The trail was again mainly through eucalyptus forests before opening up to reveal Mt Gozo and the monument on top of it commemorating the visit of Pope John Paul II. I walked with many camino friends that I’d met along the way, all hoping to arrive in time for the mass. I had a wonderful feeling of euphoria arriving into Santiago and finally glimpsing the cathedral as I walked around the maze of streets to get to Plaza Obradoiro where the entrance to the cathedral was. There were hundreds of pilgrims all walking in a hurry to arrive and we made it to the front of the cathedral with just minutes to spare and quickly snapped a few portraits of ourselves. It was a beautiful day and the sun was shining brightly, illuminating the cathedral. My phone rang just as I was about to enter the cathedral and it was my dad. He didn’t know I was arriving in Santiago today, he had just called to ask how the walk was going and as soon as he asked me how I was, the floodgates opened and the tears started… I guess I was just overwhelmed with finally arriving. We had a quick chat through my tears and then I went and joined the hundreds of pilgrims inside the cathedral for the mass. It was wonderful to see so many people that I’d shared moments with over the past month, some people I hadn’t seen for weeks… it was an incredible feeling to know that we had all made it and that we would never be the same again after this experience. Being at the mass was a very special experience that I’ll never forget. I was lucky to see the ceremony of the botafumeiro (a silver-plated brass incensory) being swung like a pendulum as eight men pulled on the rope. The original purpose was for it to perfume the church, most probably because of the smell of the pilgrims after their long journey. After mass it was time to visit the pilgrim’s office and receive my compostela certificate. I showed the lady at the desk my pilgrim’s passport with my stamps proving that I had walked the way; she asked if my reason for doing the camino was religious / spiritual / cultural… I replied spiritual. I checked into a hotel and decided that I would stay for 3 nights because I wanted to see Katharina again and she was a few days behind. The next 3 days in Santiago were a celebration with all the people I’d met along the way, it was such a joyous time but also sad to say goodbye to everyone who’d made my camino what it was. My journey however, wasn’t complete yet, I still wanted to walk to Finisterre, then Muxia and back to Santiago. Cheers! When in Galicia, you must try this gin called Nordes, from Galicia!